Many people look forward to the fall season as the temperatures start to drop, yet it still isn’t too cold. The leaves begin to fall, and it’s the perfect time to go hiking in the mountains with the family or sit around a campfire at night. But with the fall season comes new threats from outdoor pests that want to get inside your home where they can be nice and warm. Most of the insects you avoided during the summer such as hornets, wasps, and spiders are now making their way into the cracks and crevices of your windows and doors. And that’s just the start of your problem. Insects and bugs aren’t too bad when they stay in their place outside, and there’s an average amount of them. But when you start dealing with stink bugs or spiders in your home, or an infestation of box elder bugs, then you have a big problem. It’s essential that you contact a pest removal expert in Minnesota to take of the problem before it gets out of hand. But it is also good to familiarize yourself with the common pests in the area that are known to invade homes in the fall. Here are some of the insects and bugs that you need to look out for as the seasons start to change. The fall season is when spiders are their largest which helps them become more noticeable. Fall is also the time when female spiders begin laying their eggs right before they die. Spiders can be beneficial to us because they help get rid of other smaller insects that can invade our space. So, you shouldn’t knock down spider webs when you notice one outside. They are natural exterminators that are there to help. Of course, if you start seeing more spiders than usual around your home, you should get in touch with a professional exterminator for assistance. Wasps usually don’t want to get inside your home. In the summer they stay outdoors, building their nests. But once the temperature starts to cool, they need somewhere to go where it’s warm. And that’s why you end up with wasps making their way inside. Unlike many others on the list, Wasps can be dangerous if a person in your home is allergic to their stings. And their stings hurt pretty bad. So, if you start to notice wasps inside your home, or if you have a nest on or near your house, you will want to contact your local pest control right away for assistance. Hornets are another stinging pest that will want to get inside your home when the seasons change. It is during this time of year that they start to build their nests for the winter. Because they are busy constructing their new home, hornets can sometimes be aggressive, so you shouldn’t try to eliminate them on your own. Like wasps, stings from hornets can be very painful and could cause an allergic reaction in some individuals. Therefore, you should always contact a professional to get rid of any hornet nests or infestations around your home. Box Elder Bugs are not harmful, and they do not transmit any disease. But they can be a huge nuisance when they make their way inside your home. They have been known to cause severe damage to homes and plants. And their droppings can also stain light surfaces. While it is very rare for them to bite, they have been known to bite humans in defense. However, they aren’t poisonous. If you notice a large amount of these small grayish black bugs in your home or outside damaging your plants, you should contact an exterminator for assistance. These little bugs are often mistaken for ladybugs, but they aren’t. Instead of the classic red and black spotted shell that ladybugs have, Lady Asian Beetles range from yellow to red instead. These bugs are from an entirely different species and are identified by the ‘M’ mark located right behind their heads. Aside from the unpleasant odor that they carry, these pests are nothing more than a nuisance because they will invade your home quickly in a large number. Infestations can be hard to control, and you could end up finding these beetles all throughout your house on the windowsills and inside lighting fixtures. To take care of this problem, you should contact a professional for help. Ants typically cause problems inside the home during the summer, but they can appear in your kitchen or bathroom during the Fall and Winter months as well. If you notice that you have a swarm of ants in your kitchen cabinets, it is time to take care of them. They may not necessarily be harmful, but they can be a nuisance as they attack any tiny crumb of food that ends up on your floor. And it can be pretty disgusting to find a hoard of ants on food that you planned to eat. 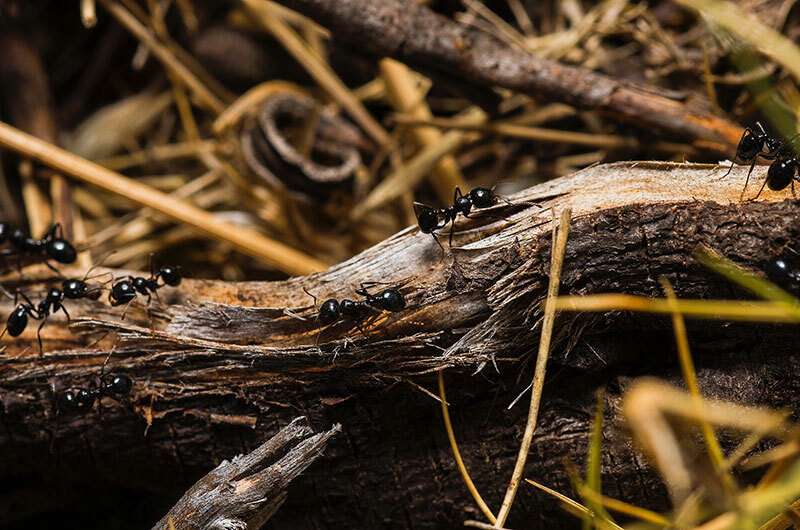 You can prevent this issue by contacting experts in pest control who can effectively eliminate all ants from inside your home and provide you with useful tips on how to prevent them from coming back soon. There are a few things that you can do to keep these pests at bay and prevent them from entering your home this fall. You could eliminate a call to your local exterminator if you choose to follow these instructions. Give your home a good thorough inspection and look for any cracks or holes in the wall, especially around doors and windows. Seal off any opening that you find to prevent common bugs and insects from getting inside. Make sure that all the screens in your windows and doors close securely and there are no gaps, tears or holes present. Install weather strips around the doors to ensure they are sealed when closed. If you are thinking about replacing your old windows, choose replacements that are energy efficient. They will effectively hold in heat during the winter and that could help discourage beetles and box elders from entering in since the exterior of the window will be colder. Because these pests haven’t been a common issue for long, many people have questions about how they can take care of Asian Lady Beetles on their own. If you have a severe problem with these beetles invading your home or attacking your outdoor plants and trees, it is always best to contact a professional. But if you only see a few now and then in your home, there are a few things you can do to get rid of them quickly. You can use a HEPA filter vacuum cleaner to capture beetles that have gathered in your light fixtures or windowpanes. Just be sure to empty out the vacuum outside following each use. You can also use an insect light trap in dark areas of your home that will attract the beetles and eliminate them on contact. These are good to add to your attic or basement. When you are tired of dealing with harmful or annoying pests in your home, it is time to get in touch with the experts in pest control in Minnesota, Abra Kadabra Environmental Services. They have the tools and knowledge that are necessary to eliminate pests and successfully prevent them from coming back in the future. To learn more about Fall pest extermination contact the professionals at Abra Kadabra Environmental at (763) 537-0330. Our experts will be happy to answer any questions you have.